For some reason, beans – baked, canned, whatever – are one of my favorite winter comfort foods. Earlier this week I posted a hundred-year-old recipe for Bean Chowder. And, when browsing though old magazines I was drawn to this hundred-year-old ad for canned Heinz Baked Beans. 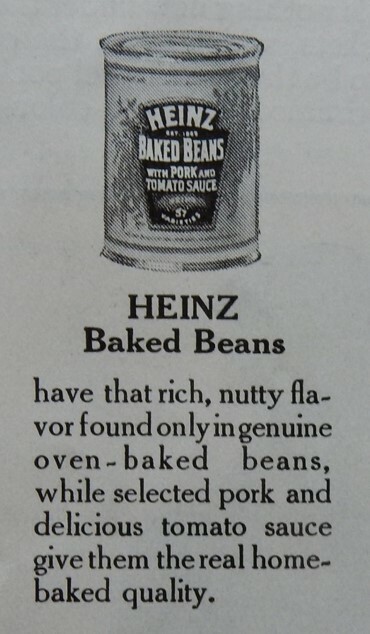 I wonder if the beans tasted the same back then as what they do now – or if Heinz has changed their recipe across the years. My husband loves canned baked beans … although they all look the same to me, he claims the ‘type’ is all important. Today you can get ‘porkless’ baked beans but when I was a kid fifty years ago, the first step was always to fish out the bit of pork. Your comment made me smile. I can clearly remember fishing out the bits of pork when we had canned baked beans when I was a child. It occurs to me that I’ve never eaten a single bean from a Heinz can. We always bought Van Camp’s — and to this day, I bypass anything with the Heinz label. On the other hand, we rarely had canned pork and beans, but when we did, we always doctored them up with bacon, brown sugar, ketchup, and onion, and baked them in the oven. I’d forgotten how good they were. I grew up in Pennsylvania, so we ate the “local” brand of brand of canned baked beans. Heinz is a Pittsburgh company. Do all American Heinz Baked Beans have pork in? In the UK, they’ve only recently started having an option with sausages in. Ours are just beans in tomato sauce. Either way, for me …. nope. I’m not sure whether Heinz makes a variety with pork in it, but there definitely are brands of canned baked beans in the U.S. with little chunks of pork in them. Yes, there generally are only a couple pieces of pork in a can of beans. I love baked beans but I’ve never thought of them as “nutty,” as the ad describes. Like shoreacres, I might start with canned beans but doctor them up. “Doctoring up” improves most canned foods. 🙂 Like you, I don’t really think of baked beans as being nutty. Definitely . . . Heinz Baked Beans are a “local” food. Fun to see the old can, and interesting question. I’m surprised to see there’s someone who never had Heinz baked beans. I wonder if there is regional variation in the popularity of different brands. We have maple baked beans here without the tomato or pork – my go-to comfort food with a side of scrambled eggs! Maple baked beans sound really good. I’ve never heard of this option before. Hard to tell. In the early 1900s people were really worried about “adulterated” foods – think of The Jungle by Upton Sinclair. At that time there was a huge movement to improve the quality of canned foods. The Pure Food and Drug Act was passed in 1906. I bet the beans have changed since that ad was printed. In my opinion it seems as if food has gotten sweeter over the years. I’ve also noticed that foods generally seem to have gotten sweeter. I’ve made many hundred-year-old quick bread and dessert recipes that were less sweet than I think modern versions of similar recipes would be. When we used to have cook-outs with my family, we always had “camping beans”. They were canned pork and beans. Also on the menu were hotdogs and potato salad. I don’t remember having these canned beans any other time. At other meals we would have dried beans soaked and cooked. Canned baked beans are a perfect camping food. When I was a child my mother often made Hallmark Baked Beans. They came in a box and didn’t need to be soaked, but they required the addition of other ingredients like molasses and ketchup. I haven’t seen that brand in years. If it wasn’t difficult enough that my husband has celiac and has to be completely gluten free (hence a gluten free kitchen), he also has a bean intolerance! So no more baked beans, bean soup, etc. I think I want to WHINE because these look so good. Oh dear – I didn’t mean to make you hungry for beans. It can be so challenging to cook when family members have dietary restrictions. At the same time it can be rewarding to figure out how to prepare tasty foods that meet their needs. I have been making Home Chef meals for 5 months now because they have gluten free options that are delicious. I never dreamed I would still be doing it. They make it so easy. Every week new recipes and they send all the ingredients. I don’t have to do anything ahead of time, just plan 30-45 minutes to make dinner. This is 2-3 x a week, so it still leaves time for inspiration, playing with recipes, or just boring whatever on the other days. Sorry for sounding like a commercial haha. It sounds like you found a nice balance that works perfectly for your family. I’m pretty pleased. It takes the burden out of having to plan ahead 21 meals a week by taking two or three out of the mix. I would not be surprised the recipe has changed over the years. My childhood favorite Ranch Style Beans (Husband Pleasing!’) changed not only the tagline to “Appetite Pleasing!” in the the 80s I think, they also changed the recipe. Advertisers know when it’s time to change a tagline 🙂 . . . interesting that they decided to change the recipe at the same time. Sheryl from what I recall, the plant was sold to another company at that time and that’s when they changed them both. But I could be wrong in my memory, I just know both changed. That makes sense. There often are big changes when a plant is sold. Love baked beans,although they are more a camping or summer food. Hot dogs, potato salad and bake beans.. I associate them with the foods served at reunions and pot lucks. My mother had a bean pot she used for years to make baked beans. It belonged originally to my father’s aunt. Mom sliced onions for the top, right before baking. She also added bacon. As you can imagine…it was delicious. This red crock now belongs to me, but I have yet to use it for this dish. Thanks for the reminder. 🙂 I agree; now that foods have more additives, sugar and fat and, in my opinion, there went the flavor. My mother also had a special, very heavy casserole dish that she used when she made baked beans. She never used that dish for anything other than beans. Exactly. Same with my mother. Mom also had a small sauce pan she used for boiling eggs. She would tell me that everything else she cooked in it tasted like eggs. I never thought that, but maybe her palate was more discerning. 🙂 But, the only thing we use her crock for is beans. I have a lot of fun finding and making the recipes I post. It’s wonderful to hear that you enjoy them.